It's the third email I received from that person whom I don't know, never met and whose product I don't need. I thought the times of cold emails were gone. Surely, anyone who has any degree of self-respect would not engage in cold communication. I was wrong. Even some decent sounding companies now practice some degrees of cold communication. What is that? Short term thinking or a "new" growth hack? If you strip down sales to the basics, you will find an exchange interaction between two humans. I have something you need (a product or a service), and you have the money or other good I'd like. To facilitate this exchange, we came up with multiple layers of abstraction. Money, corporation, marketing, sales, merchandising...etc. 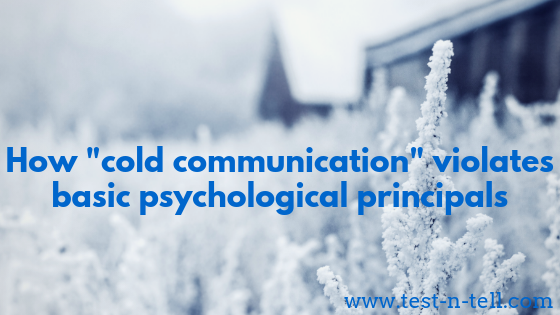 Now it's easy to see how cold communication violates all the above principals. You don't know the person sending you a cold email. Don't know whether the product they talk about might be valuable for you. And most often, you're not interested in the topic at all. - So what? - some would say, - if you're not interested - just ignore it, but I've gotten some sales from cold emails. If you've built a product that solves an existing, painful problem - you'd better of spending your marketing budget on genuine promotion in your product's problem space. When someone goes to your website, subscribe to your messages, talks to you at a tradeshow, clicks your ad...etc. It's the perfect moment for you to put the best case for your product. When your prospect is open for communication - it so much easier for both parties. Adequately addressing somebody's genuine interest would build anticipation of the future benefit you could provide. This will open a broader opportunity to exchange. And when the benefit is provided, the beneficiary starts to build trust and respect for the provider. Having those three ingredients: interest, an anticipation of the benefit and trust you'll be able to cook a long-term and mutually profitable connection. If there is one principle universally useful in business and personal life - it's respect. Only with genuine respect for the other's subjectivity, you could build mutually beneficial relationships with them. When planning your communication, double check if your chosen method is respectful towards your recipient. Trying to communicate with someone who doesn't want to hear from you is disrespectful. Pitching something to a person who doesn't need it is a waste of time and future opportunities. It takes only a few disrespectful interactions to lose any future possibility. You don't need that risk. Exercise self-respect and respect people you're dealing with to maximise your chances for success.